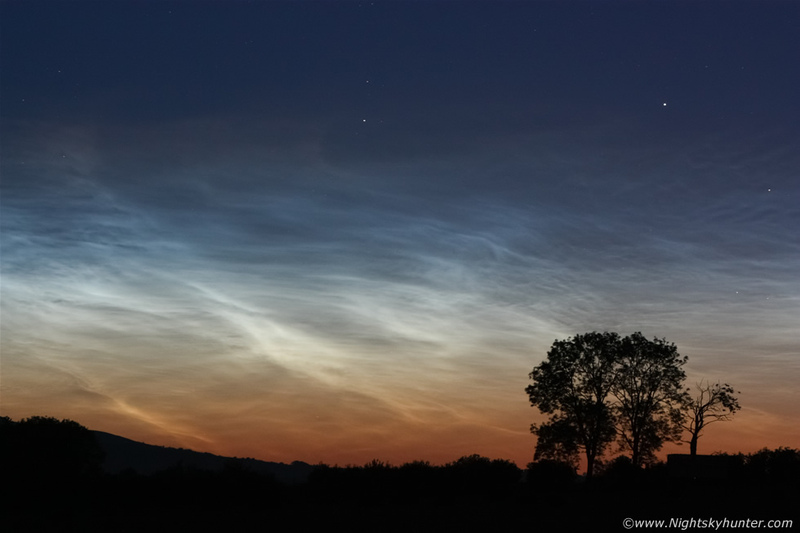 Stunning all-night NLCs captured over the hills which flank Slieve Gallion near the Cookstown carriageway on June 9th 2013. A vivid bed of orange above the long gone sun painted a particularly beautiful scene contrasting with the silvery-blue NLCs which were exhibiting swift real time motion across the stars of Auriga. Note the very complex whirls, knots, bands and waves often overlapping creating a very 3-D like appearance and casting subtle shadows onto other background NLC structures which made for a mesmerizing sight, this for me was the best display of the 2013 season. * All images are available for sale in the form of photo prints, canvas or digital files for licensing, if you are interested in a purchase simply drop me an email.